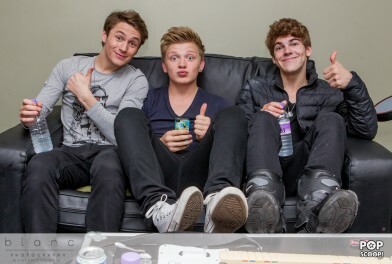 life after the X Factor seems to be flourishing for District3. Micky Parsons, Greg West and Dan Ferrari Lane have come to the end of their own UK tour, the 3eek Out Tour where they have been showcasing some material from their upcoming EP. On the 30th of May, we made our way to the O2 Academy Oxford to hang out backstage with the boys and Pop Scoop managed to get you an interview in-between Dan changing pants and t-shirt, Micky singing, and Greg rocking with his guitar controller. Not content with just that, our in-house photographer Lee Blanchflower was at hand for an amazing behind the scenes photoshoot. Feast your eyes on these 3eeks!! !